What is turrón? Seriously, Spain, I need to know. Turrón is nougat. Right? I thought I had a pretty good idea of what turrón is before I went to southern Spain. Now I’m not so sure. Here’s what I do know. Turrón (in Spanish), torró (in Catalan and Valencian) or torrone (in Italian) is an almond-based sweet whose roots apparently stretch back to 15th century Islamic Iberia, drawing from Arab and Berber confectionery tradition. Today in Spain, it’s associated closely with the Valencian Community and in particular the cities of Alicante and Jijona — although it’s eaten as a Christmas treat throughout Spain and the former Spanish empire. I thought I had a pretty good grip on the general idea behind turrón: it’s a type of nougat made with honey and almonds. Usually orange blossom honey. Usually marcona almonds. Sometimes soft and chewy. Sometimes hard and barely chewy. So — that’s turrón. Sugar. Honey. Toasted almonds. Whipped egg white. Right? On an all-too-short roadtrip with some new buds through Valencia, Murcia, and Andalusia, I found out that I’m a moron about turrón. Turns out there’s a whole confusing range of sweets that commonly bear that name turrón, and my confusion of course is complicated by my lack of Spanish beyond hola and por favor. I tasted a whole bunch, made some mental notes, and brought some packages home with me “for research.” Here’s what I think I know. Hard turrón de Alicante (top) & soft turrón de Jijona (bottom). Tastes great, looks questionable. Photo: Lablascovegmenu. This is commonly called “the original turrón,” going back some 500 years or so. It’s whole roasted almonds, bound together in an opaque, cream-coloured, hard candy matrix made from some combination of orange-blossom honey, sugar, glucose syrup, and egg whites. It may or may not be finished with a neutral-tasting starch wafer on the outside to stop it from sticking to everything. You could call this nougat, I suppose, but the texture is more or less identical to what’s most commonly referred to in English as brittle, made a little lighter by the egg whites. Snappy, crunchy, and a little bit challenging to eat without the help of some kind of smashing utensil. 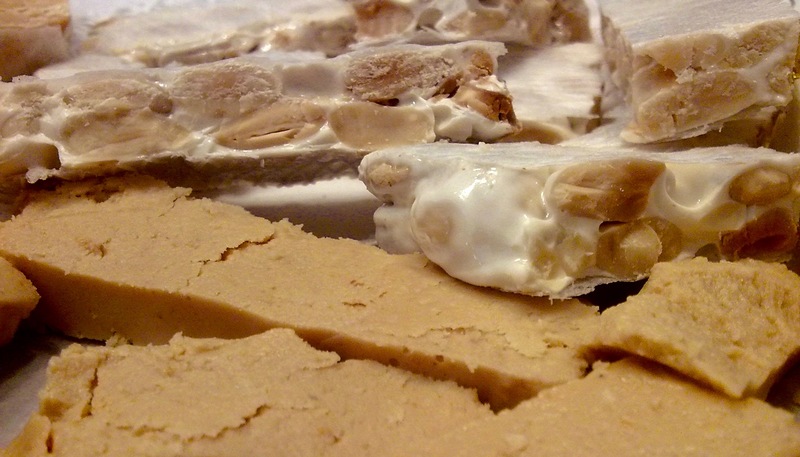 Turrón de Alicante has protected geographical status and has to be made in the Valencian Community to carry that name. If it’s not made in Valencia, it’s usually just labelled turrón duro. This is “the other original túrron,” hailing from the small city of Jijona (Xixona in Valencian). By modern standards, the traditional recipe is slightly insane — you basically make Turrón de Alicante from start to finish, and then put the whole thing into a mill to break it down into a paste. It’s the medieval equivalent of one of those Pinterest recipes that get you to combine Oreo cookies, candy canes, and birthday cake to make a pie shell. Turrón de Jijona is often called “soft nougat.” That’s where the big surprise came for me, since the texture is nothing like what you would expect from that description. Rather than a chewy, soft paste, this turrón is unyielding at first, then dry and crumbly between the teeth, finally dissolving away on the tongue like sugary peanut butter. On a topographical map of candy, I’d put it right next to tahini halva — they’re both working the same nut-butter-and-cooked-sugar thing. In fact, the modern recipes are fairly similar: you cook down a syrup (hard ball to hard crack stages) and then blend that into an already-ground preparation of nuts or seeds. Turrón de Jijona is commonly offered in smooth and grainy versions, the latter retaining some small almond bits for additional texture. You’ll also see versions with lemon peel or cinnamon added. Like turrón de Alicante, it has protected geographical status and must be made in the Valencian Community. It’s usually labelled turrón blando if made elsewhere. At first glance, these appear to be turrón de Jijona with the addition of egg yolk. The texture, however, is another surprise. These are yielding, soft pastes much like marzipan, with a slight “cakiness” that I assume comes from a higher proportion of eggs in the recipe. Soft, marzipan-like turrón de yema tostada by Turrones Ramos. Photo: Turrones Ramos. Turrón de yema tostada is the same as turrón de yema, except it goes through the additional step of getting toasted or seared on the top and bottom. This lends a subtle caramelized flavour and enhances the cake-like texture. It also makes the pieces nicer to look at, I reckon. More recent additions to the turrón canon, these are both straight-up almond brittles, with the egg white omitted and the sugar and honey caramelized more aggressively. Their existence suggests that eggs aren’t really a critical part of the definition of turrón. Crunchy, caramelized, and eggless turrón de guirlache by Turrones Ramos. Photo: Turrones Ramos. I’ll admit that, if there is a distinction between the two names, I haven’t quite figured it. I saw versions with peeled and unpeeled almonds, and versions with and without the addition of sesame seeds, but the labelling of each did not seem consistent. Maybe they’re just two names for the same thing, or regional variations. If anybody can enlighten me, I’m all ears. Now this is just confusing. Marzipan seems to exists as a separate idea in Spanish confectionery, and yet I repeatedly saw blocks of marzipan labelled “turrón de mazapán.” The only distinction from products labelled as marzipan seemed to be the large block shape and sometimes the addition of lemon peel and cinnamon. Is this just terminology confusion caused by marketing speak? Or does it suggest that neither honey nor eggs are necessary to make a turrón? The final point of confusion. Turrón de Agramunt has protected geographical status in Catalonia, northeast of Valencia, but is largely identical to turrón de Alicante. The one big difference is that it can be made with almonds or hazelnuts. That’s correct: turrón does not even have to have almonds in it. If you’re keeping track, that leaves us with just sweetener and nuts as the defining characteristic of a turrón. Basically, nut candy of any kind, in some sort of bar form. So there you have it. Sometimes turrón is nut brittle. Sometimes turrón is halva. Sometimes turrón is marzipan. And sometimes — just sometimes — turrón is nougat. This isn’t taking into account a huge array of modern interpretations in Spain. Like chocolate turrón. Soft turrón with dried or candied fruits. Pistachio turrón. Coconut turrón. Even golden turrón. And I didn’t even start looking into which makers are famous for what and who makes what better. But I did see encouraging signs that turrón production hasn’t been industrialized to the same degree as other confectionery, and the emphasis still seems to be on good quality ingredients, traditional recipes, and small-to-medium makers. 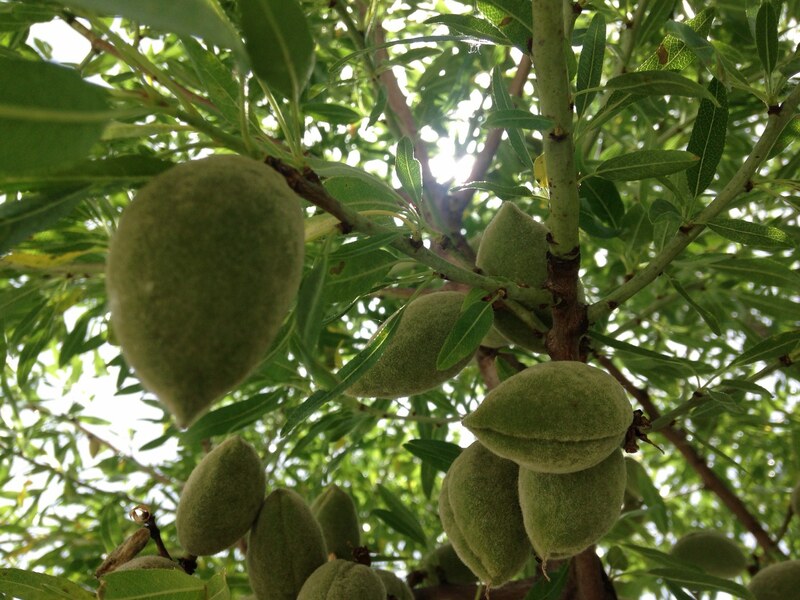 Young Marcona almonds growing in the middle of the City of Valencia. Previous Previous post: Quin Candy in Portland, Oregon is the real deal. Next Next post: Sugarfina Candy doesn’t make candy. Maybe that’s ok? But maybe it isn’t?